Statement submitted in a damages lawsuit filed by Jews who were arrested when they blew the shofar and prayed at the site 4 years ago. 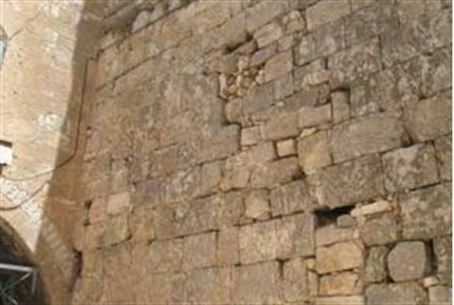 The State's representatives have determined that the "Kotel HaKatan" ("Small Kotel" or "Small Wailing Wall"), a wall which is a continuation of the Kotel in Jerusalem, is not a holy site. The statement was submitted to the court as part of the reply to a damages lawsuit filed by a group of Jews who prayed at the Small Kotel on Rosh HaShana of 5767 (2006). One member of the group, Elihu Kleiman, was arrested after he blew the ram's horn, or shofar. The group of Jews who sued for damages also said they were beaten by police, who denied them their freedom to worship at a holy site. The "Small Kotel" is nothing but "an inner courtyard of several residential homes in the Muslim quarter," the State determined in its response. Like the Kotel, the Kotel HaKatan is an exposed face of the original western wall of the Temple Mount, built by King Herod over 2,000 years ago. However, compared to its famous "bigger brother," the Small Wall is less accessible and looks less impressive: it is barely 10 meters long, less of its height has been exposed and its plaza is much narrower. In fact, however, the Kotel HaKatan can be considered holier than the better known Kotel, because it is located 200 yards to the north – and therefore practically opposite the actual site of the Holy of Holies in the original Holy Temples. Attorney Daniel Robins, who represents the group of Jews who were praying at the site in 2006 and who sued the State, told Arutz Sheva's Hebrew-language service that Rabbi Shmuel Rabinovich, the Kotel Rabbi, testified before the court as to the sanctity of the site, but the State rejected the power of Jewish Law to determine the site's sanctity. Robins said that he hopes the State is not acting out of political considerations in rejecting the sanctity of the Kotel HaKatan. He noted that the site is included in the area that Defense Minister Ehud Barak wants to hand over to the Arabs in a peace deal. Work recently began on refurbishing the Small Kotel plaza.